The Ferret Association of Connecticut is committed to operating transparently. In addition to filing detailed annual reports to the US Internal Revenue Service (available through Guidestar), FACT publishes an end-of-year income and expense report to members each year in our January/February newsletter. It forms the basis for developing our next year budget, which is approved by FACT’s Board of Directors. This process allows us to appropriately manage income and expenses each year; identify potential gaps; and provides a solid foundation for funding appeals to grantors. The following chart is from our Annual Report. 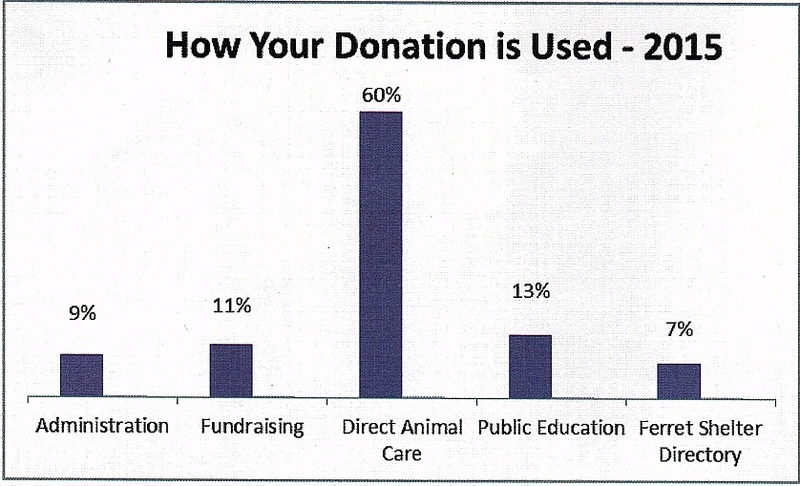 It displays at-a-glance how donations were utilized last year within the Ferret Association of Connecticut.